Three years ago extreme drought conditions across the southern U.S. caused a wave of devastating fires in Texas that charred 4 million acres of land and destroyed thousands of homes. With water supply reservoirs quickly draining and no significant rainfall expected to replenish natural sources, the possibility of a long-term environmental shift–perhaps fueled by climate change–began to force cities across the state to reevaluate their water usage, especially those of San Antonio and Austin. The 100th Meridian is frequently used as a simple marker dividing Texas between the arid western interior and the eastern part of the state, which benefits from abundant rainfall produced by weather systems that come in from the Gulf coast. However, daily per capita water use does not necessarily follow the same pattern. Certain cities on both sides of the wet-dry divide continue to consume large amounts of water. According to the Texas Water Development Board’s 2011 data, El Paso’s daily use was 143 gallons, and the wet southeastern city of Galveston had a per capita use of 302 gallons. One of the highest per capita figures was found in Midland, which is located in arid West Texas. Though the official data is not in just yet, Midland’s Interim Utilities Director Holly McGrath-Rosas estimates that the city has nearly halved its water consumption since the drought. As extra-dry conditions continue, similar management efforts across the state have given rise to a greater general awareness of a dwindling water supply–sparking a cultural shift toward intensive water conservation. The push for conservation has been particularly strong in San Antonio and Austin, which are situated slightly east of the 100th Meridian divide. In 2011 San Antonio had a daily per capita water use of 148 gallons, just a little lower than Austin’s 157 gallons during the same year. Both cities have managed to reduce their water use since the peak of the drought, however. In 2013 San Antonio and Austin used an average of 127 gallons and 138 gallons per day respectively. That’s less water used than Dallas and Houston, but more than the arid El Paso; at 8.7 inches of annual rainfall this desert city has needed to implement significant conservation measures for some time. Texas State Climatologist John Nielsen-Gammon commented that unique hydrological circumstances have deeply affected San Antonio and El Paso, making these cities the traditional state leaders in water conservation efforts. San Antonio had additional motivation for jump-starting its conservation efforts when concern over endangered species forced immediate efforts to preserve the natural water supply. When the drought began, this meant that the city was already on its way to improving water usage. During the 1990s it was found that the Edwards Aquifer, San Antonio’s main source of drinking water, fed springs that were home to several endangered species, such as the Texas blind salamander. In 1991 the Sierra Club brought an action against the federal government to protect two springs inhabited by the salamander and six additional endangered species. A federal judge gave a favorable ruling for conservationists in 1993, limiting the pumping of water to nearby cities. According to Nielsen-Gammon, immediate management of the aquifer was needed to ensure that sufficient water would continue to flow into natural springs, allowing the native species to survive. This meant that the long-established practice of pumping huge amounts of water for nearby cities–San Antonio included–had to be reined in significantly. The city has also implemented a variety of saving measures, including retrofitting inefficient water fixtures in schools and hotels and installing high-efficiency toilets. More recently the city water system has announced plans to desalinate abundant brackish ground water as an additional source of usable water. The organization is also working to raise awareness about ongoing drought conditions and provide information about how much residents should water their lawns based on weekly weather forecasts. Nearby Austin is rapidly catching up with similar management efforts. Between 2006 and 2013 the city achieved a 13 percent reduction in average water consumption per capita. Daily demand per capita over the last 25 years peaked in 2000, when Austin residents used almost 195 gallons daily. That number decreased to 180 gallons in 2008, and last year fell to 137 gallons per capita daily. Xeriscape landscaping is one innovative approach to conservation that many Texan residents are beginning to explore–replacing water-wasteful lawns with native, drought-tolerant plant species that thrive with minimal irrigation. Many native plants used in xeriscapes only need to be watered once a month, and even hardier species only require the occasional watering during the height of summer or a hard drought. 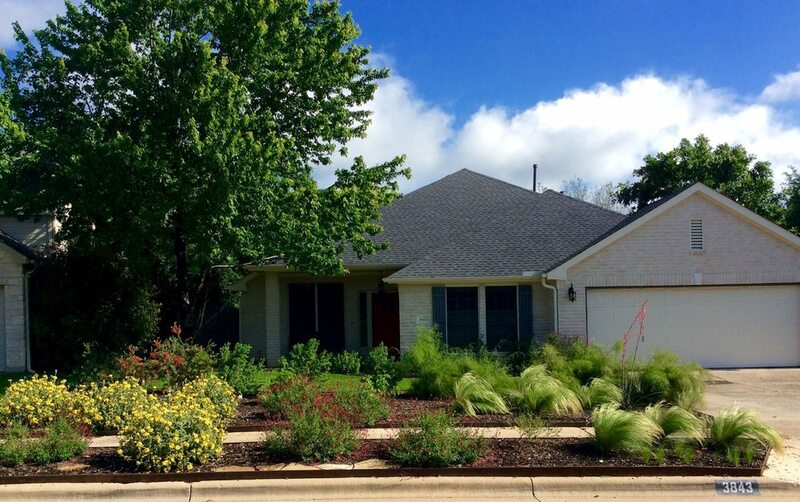 If you are in Austin or Central Texas and you would like to learn more about installing your own drought-resistant, low-maintenance xeriscape, you can trust the experts at Austin Native Landscaping to help you out. Contact us today to get an estimate for your custom, watershed-friendly landscaping project. Next: Next post: Preserving Native Texas: Conservation Workshops, Native Garden Tours, and Family Festivals!